« Bond Market Screaming For Rate Cut - Fed Listening? Wall Street has a knack of bringing new financial products online just as the demand for them is at its zenith. In Wall St. parlance: when the ducks are quacking, feed them. 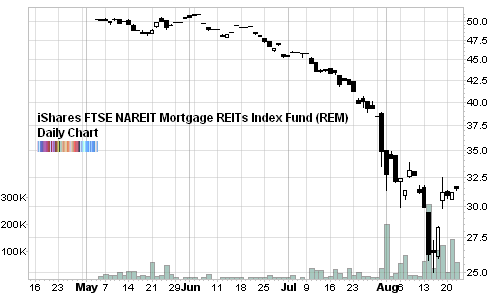 On May 4th 2007, the iShares FTSE NAREIT Mortgage REITs Index Fund (REM) started trading around $50. I’m not saying that these firms are bad investments. On the contrary, they create a lot of value. But buying here and now at these prices? I’m not sure that’s wise. Seeing as how it is their job to know when to sell what, it makes perfect sense that they would flip their shares to the public when they knew they would get the highest price for them. Blackstone fell from a high of $38 to a recent low of $22. Now that all things related to mortgages are avoided like the plague, it would take a smart contrarian to buy the mortgage ETF here. This is another example of an investment vehicle that is created not because there is a demand for it, but because Wall Street believes they can create demand for it. It should start to ring clear with both of your examples (mortgage REITs, Blackstone IPO) that if you want the bank that the “smart money” has, buy what they buy and sell what they sell…don’t buy what they sell. This is not a 2nd grade exercise in sharing, these people are out to make money.